– Google sets up in China. – China steals their tech and algorithms. – China sets up their own heavily censored internet. All made possible by a greedy Google. Good news is these people didn’t vote! 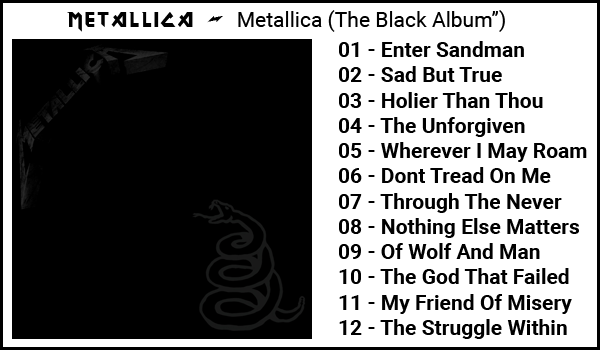 “Metallica’s self-titled 1991 album (often referred to as The Black Album, due to its stark, black album cover) scores its 500th nonconsecutive week on the Billboard 200 chart. It is now one of only four albums with 500 weeks or more on the tally…Among all albums — since the chart began publishing on a regular weekly basis in 1956 — Pink Floyd’s The Dark Side of the Moon holds the record for the most weeks on the chart: 937. It’s followed by Bob Marley and The Wailers’ Legend: The Best of Bob Marley and The Wailers (539), Journey’s Greatest Hits (539) and Metallica’s Metallica (500). Metallica’s self-titled album marked the rock band’s first No. 1 on the Billboard 200, when it debuted atop the list dated Aug. 31, 1991. The set spent four weeks on top, and marked the first of so far six chart-toppers for the group.